Hydro-Seeding is a vegetative planting process, that utilizes a mixture of specially processed mulch(s), seed, and water. The hydro-seed mixture is applied using a specially designed piece of equipment, called a Hydro-Seeder. Our organic fertilizer can be blended with the hydro-mulch mixture, representing the most effective and economical biological approach to turf establishment. What is Hydro-Seeding used for? Hydro-Seeding is a fast and affordable way to install or repair damaged turf areas in your lawn, sports fields, or along roadsides. The ability to custom blend seed for virtually any application, allows us the ability to match the surroundings/meet your objective(s). Hydro-seeding is becoming more and more popular, as more home owners, contractors, and goverment agencies come to realize the staggering benefits of hydro-seeding. How much does Hydro-Seeding Cost? Hydro-Seeding is typically priced by the square foot or acre. Price will vary by market and application. Under most circumstances, you will find that hydro-seed runs about half to a third the cost of sod! It's more comparable to the price of conventional seed/straw/tac methods. Hydro-Seeding offers a wide array of benefits. Some key advantages of hydro-seeding are moisture retention and erosion control. The hydro-seeding application forms a mulch blanket. This blanket aides in water retention and soil erosion. Soil is often the culprit of failed projects. 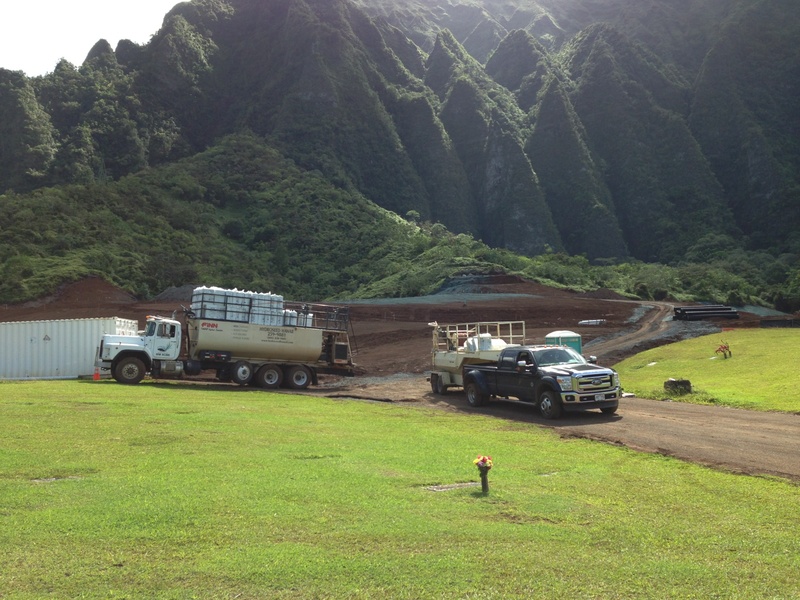 Hawaiian Hydroseeding has a number of products we can incorporate in the hydro-seed mixture. This improves soil fertility and affordably reclaims contaminated soils. Things like spilled fracking fluids, salts, carbons, and excessive fertilizer, can leave soil infertile, if left untreated. As part of our commitment to providing our customers with the exceptional service, superior products, and personal attention they deserve. Sodding a lawn gives instant gratification but costs more than seeding or hydroseeding. The soil bed needs to be prepared in the same way it is when seeding or hydroseeding is done. This will ensure that the sod, seed, or hydroseed is not just laying on the ground but that the roots are able to take hold as they should. Remember that the sod will raise the level of the soil about an inch. This will be most evident around sidewalks and driveways. Hydroseeding is becoming more and more popular as an effective means of establishing a new lawn. Hydroseeding also allows for a better root formation as opposed to sodding. Hydroseeding is typically about half the cost of sod and requires about 1/3 the amount of watering. The hydro-mulch makes up the bulk of the hydroseed mixture. Hydro-mulch can be made from a number of products. Most of the products used to manufacture hydroseeding mulch can be classified as organic, adding to the already staggering benefits of choosing hydroseeding for your next project.. Many forms of hydro-mulch exist today. One of the most common products used for residential lawns is a mixture of wood, cellulose fiber, and recycled paper. Other products include compost, cotton, and straw among others. The hydro-mulch, seed, and fertilizer are mixed with water in the hydroseeding equipment, this gives the mixture a thick slurry like texture. The hydroseed mulch will act as a blanket to aid in the retention of moisture as the seeds sprout. It will also help shield the seed from heat and birds. What are the terms for payment of services? How long after installation before the hydro-seed application will be inspected? Is the company a member of any professional lawn care associations, such as "The International Association of Hydroseeding Professionals" or any other associations / organizations? Some hydroseeding companies work exclusively with large scale commercial hydroseeding projects while others will only work on small residential hydroseeding jobs. Find a hydroseeding contractor that has the proper equipment for your size project. Most any type of grass seed can be used in Hydroseeding however, factors such as climate conditions will be the determining factor as to which grass type is recommended. At Hawaiian Hydroseeding,m we use Zoysia El Toro grass as our choice for the tight thatch, deep color, and resistance to little water and shade. This will often vary depending on the type of grass seed used, condition of the soil and recommended fertilizer types. A common practice is to apply a nitrogen rich fertilizer soon after the first mowing has been done. Weeks 4-6 are common fertilizing times. When in doubt, an Expert at Hawaiian Hydroseeding should be consulted as improper fertilization could cause severe damage to your lawn. As a general rule of thumb, the first mowing is recommended once the lawn reaches 3-4 inches in height. The 1/3rd rule is a good guideline, You should never remove more than 1/3rd of the grass blade at one time. IS HYDROSEEDING A NEW TECHNOLOGY? No! Hydroseeding has been around since 1953. WHAT IS HYDRO MULCH AND WHY IS IT GREEN? Both wood and paper mulches are white in color. The green dye is used to help see where and how much is applied on all types of soils. The darker color will also aid in heat absorption promoting quicker seed germination. WHAT IS THE DIFFERENCE BETWEEN HYDROSEEDING, HYDROMULCHING, AND HYDROSPRIGGING? The term "Hydroseeding" is a generic term which is often used to describe many hydraulic planting techniques. Actually…Hydroseeding is technically the term used to describe the application of a slurry, which is a mixture of water, grass seed, fertilizer, and fiber mulch to a site where turf is desired. Hydromulching is the same process, except it denotes using a heavier slurry. If live grass stolons (sprigs) are used, it is referred to as hydrosprigging. As you can see, it gets a little confusing, which explains why most people just say "Hydroseeding". WHAT IS THE PROCESS AND HOW DOES IT WORK? Hydroseeding is a grass planting process. This grass planting process is fast, efficient, and economical. The process is frequently more effective than conventional seeding or stolonizing and more economical than conventional plugging or sodding. The process begins by mixing mulch, seed (or sprigs), fertilizer, and water in a tank. Then the material is pumped from the tank and sprayed onto the ground. The mixed material is often referred to as a slurry, and looks very similar to green paper mache. Once applied to the soil, the material enhances initial growth by providing an environment beneficial to seed germination and/or sprig root development. WHERE DO YOU USE THIS PROCESS? Hydroseeding can be use anywhere turf or groundcover establishment is required. IS HYDROSEEDING A SUPERIOR METHOD OF PLANTING GRASS AS COMPARED to "PLUGGING"? There are many variables to consider when determining how turf should be established on a site. There are advantages and disadvantages to each method. Plugging...This method is best suited for a site which does not have automatic irrigation. The plugs (sod cut into small squares) are capable of establishing with limited irrigation. However, there are many disadvantages to plugs. First of all, it is very labor intensive (a 2,000 sq. ft. lawn will typically require 1,200 plugs to be planted!). Second, using the plugging technique will leave bare soil exposed for several months, which will lead to erosion, mud, dust, and weeds. Finally, once the plugged lawn finally fills in (it takes a LONG time), the plugs you started off with will have a denser root mass than the surrounding areas, thereby creating a "checker-board" effect. The "checker-board" effect is not only an eyesore, it is a maintenance complication. Hydroseeding...Seed (or sprigs), fertilizer and mulch are applied in one step. This process is usually less costly than plugging (less labor). When done by an experience contractor, hydroseeding will produce a quality stand of turf very quickly, while also limiting erosion, mud, dust, and weeds. WHAT IS EXPECTED FROM THE CUSTOMER? A good mulch application will reduce moisture evaporation from the soil. Grass seeds and/or sprigs need soil moisture to grow, and that moisture must come from either irrigation or rainfall. Poor growth is almost always due to lack of water. WATER! WATER! WATER! Without adequate irrigation, the establishment time and coverage will vary significantly. To ensure quality turf, proper watering is essential. An in-ground irrigation system makes the application of water much easier and more efficient. HOW LONG WILL IT TAKE TO FOR MY LAWN TO GROW? The time it takes to establish a good stand of turf is highly dependent on the type of grass you decide to plant. For example, Seashore Paspalum can be established in as little as 4 weeks, while El Toro Zoysia may take as long as 4 months. There are many other variables to consider as well, such as site location, soil type, irrigation methods, etc. A quality contractor will help you make an informed decision. CAN I SPRAY OVER WEEDS? Not recommended unless you do not care to have a nice stand of turf. The watering to get the grass established and the fertilizer applied will feed the weeds causing rapid growth and spreading. DO I HAVE TO PREPARE THE SOIL? You have a unique opportunity to kill your weeds, loosen soils, and amend the soils with additives. All of this will promote quicker and healthier grass establishment. The addition of compost and other amendments is the best way to benefit your turf for the long term. Doing this will reduce watering, fertilizing, and stress. A good mulch application also provides erosion resistance. When soil erosion is reduced or prevented, and the seeds (sprigs) are held in place, a more uniform coverage of grass is assured. When applied correctly by a quality contractor natural rain fall will not cause anything to move. Even severe slopes are protected if installed properly. Down spouts, ditches, and other forms of channeling water may require additional attention..... ask your contractor for specifics on your site.